Celtic manager Ronny Deila is hopeful left-back Kieran Tierney's ankle injury is not serious. 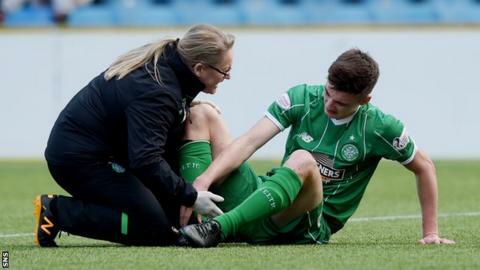 Tierney received treatment during Celtic's win at Kilmarnock and tried to play on but was replaced by Dedryck Boyata before half-time. The uncapped 18-year-old has been named in Scotland's squad to face Denmark at Hampden later this month. "I don't think it is a big thing, hopefully not," Deila told BBC Scotland. "But it is too early to say whether he is going to be with the national team or not. Scotland coach Gordon Strachan named separate squads for the friendlies with Czech Republic and Denmark, with the Scots playing in Prague on 24 March. Tierney, who has played at Scotland Under-18 and Under-19 level, made his Celtic debut late last season and has been a regular in Deila's side this term.